A cataract is a clouding of the eye’s lens that causes loss of vision. 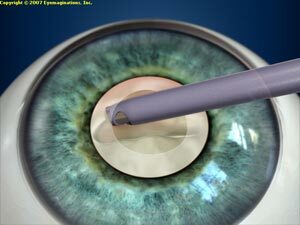 This document is about age-related cataract, the most common type. The lens lies behind the iris and the pupil. It works much like a camera lens. It focuses light onto the retina at the back of the eye, where an image is recorded. The lens also adjusts the eye’s focus, letting us see things clearly both up close and far away. As the cataract gets bigger and clouds more of the lens (some doctors use the term, “ripens”), you will find it harder to read and do other normal tasks. 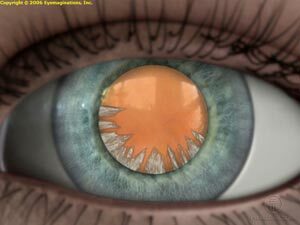 The word “cataract” means waterfall. 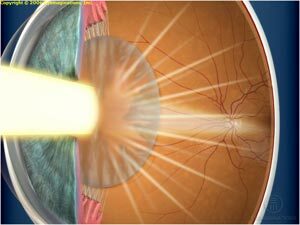 For people with a ripe cataract, it is like trying to see through a waterfall.